Published 1st January 2015 by Chicken House books. Goodreads Synopsis: Written by acclaimed children’s novelist Dan Smith, BIG GAME is a stunningly told survival story set in the icy wilderness. 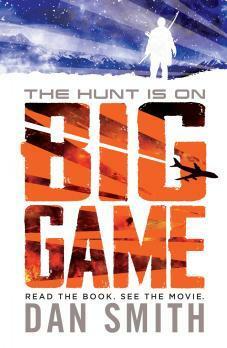 My Review: I started Big Game a little apprehensively. I had read and really enjoyed Dan Smith’s previous historical novel, My Brother’s Secret (review here!) – though this new book is a novelization of a movie script, for a film of the same name. I wasn’t sure how I’d find it, because of that – would it be as good as Dan Smith’s historical YA? Would it be as enjoyable? I was a little nervous but very eager to read it, as the synopsis was awesome. I loved Dan Smith’s writing yet again. It was fast paced and I was sucked straight into the story. I really loved Oskari’s narration. He’s comes across at first as a character defined by his flaws, but he flourishes throughout the story as an incredibly brave, powerful protagonist. He was so fun to read about! I really enjoyed seeing him develop. The plot was so great and I am really looking forward to seeing it played out on a big screen. On the night before Oskari’s birthday, he must embark on a journey to the Finnish forest, and stay there for a night and a day. When he returns, he will be a man and must present a trophy – a hunted animal that will reflect his personality. However, when he finds the president of the U.S.A in an escape pod after witnessing terrorists land close by, Oskari realises there’s a much bigger game being played than his own hunt. It felt really original and exciting to me; a real pulse-raiser of a book. The ending felt a little abrupt, but made me smile. I received a copy of Big Game from the publisher, in exchange for a review. In no way at all did this affect my thoughts. This entry was posted in Uncategorized and tagged 2015 movie, 2015 release, action, adventure, big game, dan smith, fiction, film, finland, MG, novelisation, samuel l jackson, terrorism, thriller, usa, YA on March 3, 2015 by keithbwalters.